My Creature Design work this week has gone rather well. 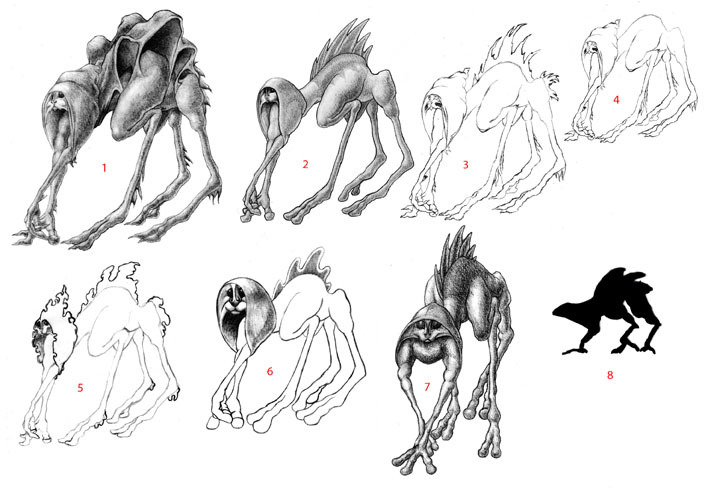 Our assignment was to create a fully rendered color illustration of our creature design. I took the most recent silhouettes that I liked from last week and refined a few into clearer designs. I eventually found, to my own surprise, that the design I liked best actually stemmed from one of the last two silhouettes that my instructor had chosen, without the luminescent tail that I’d really wanted to include. I had been surprised that he had chosen the silhouettes that he did because they seemed to be among the more conservative designs on the page – I thought that many of the others had much more interesting forms to them. When I started refining the designs, however, I changed some of the proportions of the initial silhouette and voila! It worked! I had created a creature with a built-in hood hiding his face as I’d wanted, but with more interesting proportions as the instructor had requested. I took the new design and drew a few different versions of it with different surface forms to create a similar kind of silhouette and eventually came up with the idea of a form like a fleshy cape billowing down his back the match his built-in hood. I am very pleased with it. Then I did some hue adjustments to try for some other color combinations, but I think I still like the original best. After seeing the finished illustration in class, Micah asked me to take some of the yellow bioluminescence from inside the hood of color creature #2 and add it to creature #1, and also to work on the hind leg proportions a bit more. Last but not least, for my Photo-Real Rendering class this week I created a few different textures on a material ball provided by the instructor. We were supposed to create 2 materials primarily defined by each of the following surface properties: Diffuse, Specularity/Reflectivity (which is, surprisingly, the same thing), Transparency, and Subsurface Scattering. I spent an entire day rendering a number of materials, but I’m only marginally satisfied with the results - and it’s not Modo’s fault - it’s my own ineptitude at defining materials that’s the problem. I need a lot more practice with this.